D-BALL – THE BALL OF THE FUTURE! Ok, so not really, but D-Balls are pretty nifty, and can help add a unique aspect to your normal workouts that you wouldn’t normally get. They help work your core in ways that traditional medicine balls could never do. So what is a D-Ball? It’s essentially just a medicine ball, but instead of a solid core of rubber or polymer, it’s filled with sand. This is why it’s termed a “dead ball”, or a “slam ball”. It doesn’t bounce, at all. Standard medicine balls have at least some bounce to them, but D-Balls literally drop “dead” once they hit the ground. This offers a “dead weight” type of scenario, which when used in specific workout routines, challenges you to use muscles that rarely get used, especially in your abdominal core. These balls have become incredibly popular with the rapidly expanding high intensity interval training exercise programs across the world. One advantage to not having a solid core is that a D-Ball can be far heavier than a standard medicine ball. 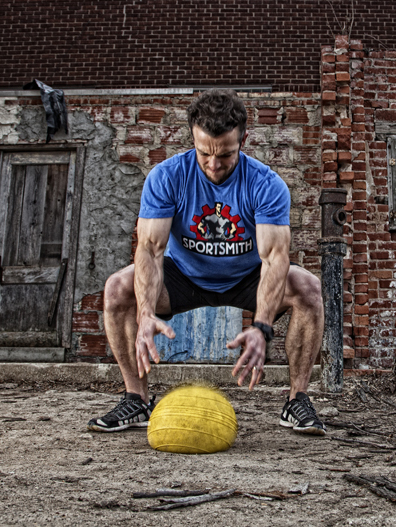 SPORTSMITH currently carries balls in various sizes, all the way up to the massive 100lb. ball which is twelve inches in diameter. 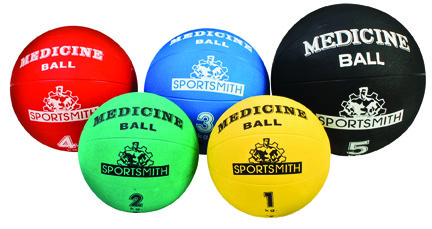 Standard solid core medicine balls simply cannot be made this heavy, due to their design. Once again, SPORTSMITH is proud to offer our customers the latest and greatest in sports and exercise equipment. Go to our website at www.sportsmith.net or give our toll-free number a call to place an order today! It’s easy, fast, and we offer same day shipping on all orders. We also ship internationally, so what are you waiting for? Get to clickin’!